Who are the “gilets jaunes” (yellow vests)? The French protesters known as “gilets jaunes” or “yellow vests” – for their use of the distinctive yellow high-visibility jackets required to be carried in every vehicle by French law – have staged some of the most comprehensive protests seen in France since 1968. What many of the protesters had in common at the outset was their reliance on cars to get around, often living in more rural and less populated parts of the country, and thus the initial action which they responded to was the proposed sharp increase in fuel tax. Theirs is a grassroots-level movement without a leader, though there are some prominent spokespeople. It has been organised via online groups and Facebook pages, and members have presented their grievances through petitions, videos and calls to action. As the movement has grown, their demands have evolved into a general anger at higher living costs and President Emmanuel Macron’s economic policies. Some experts describe the majority of the protesters as “people who struggle to make ends meet at the end of the month”. After almost three months of weekly protests, the movement now cuts across broad sections of society, across professions and geography as well as race, age and gender and includes members of the working and middle classes, all affected by the higher cost of living. Its members range from factory workers and the unemployed to the self-employed (particularly artisans) and retired people. What began as a tax hike protest has developed into a general disillusionment with Mr Macron and his government. He was elected on a platform of economic reform, which the French people were assured would improve their lot – lowering unemployment and kick-starting the economy. However, many feel this hasn’t happened and an analysis of the 2018-19 budget paints a bleak picture. France’s public policy institute found in their analysis of the budget that that the poorest quarter of households would largely see their income drop or stay the same under Mr Macron’s proposed economic reforms. Middle-income earners would see a modest improvement, but the greatest beneficiaries would be those who are already wealthy, in the top 1%. The outlook for retired people was the worst – almost all of whom will be worse off under the proposed reform plans. But the movement is about more than economic justice: it is also about democracy. A critical demand is for greater participation in decision-making, for greater control over their own lives. A majority of French people see Mr Macron as cut off from reality. A recent poll by Elabe found that almost eight in 10 French people thought he was authoritarian. In an attempt to address this apparent lack of representation, Mr Macron initiated the national “great debate”. In January, Mr Macron announced three months of national town hall meetings — “grand debates” — to hear the grievances of protesters in the hopes of addressing them. In a letter to the French people published on 13 January, Mr Macron explained the debates were a way to “transform anger into solutions”. Mr Macron’s vast nationwide debate process, which continues until March, is an exercise that has never been attempted before in France. Some political opponents – and gilets jaunes protesters themselves – have questioned whether the government will really listen to citizens’ suggestions. In a recent public meeting, Mr Macron admitted that France has seen a “breakdown in equality”. Many participants in these debates have expressed their exasperation to the president, warning of the “segregation” and “ghettoisation” of communities. Philippe Rio, the Communist mayor of Grigny, received applause when he said that deprived communities on the outskirts of cities “don’t want charity but justice”. He went on to explain that social and “territorial apartheid” exists in France and has not been fixed by the state. He said people on housing estates felt that in the eyes of the government they didn’t exist, that the French promise of “liberty, equality, fraternity” was “reserved for those of a certain caste”. 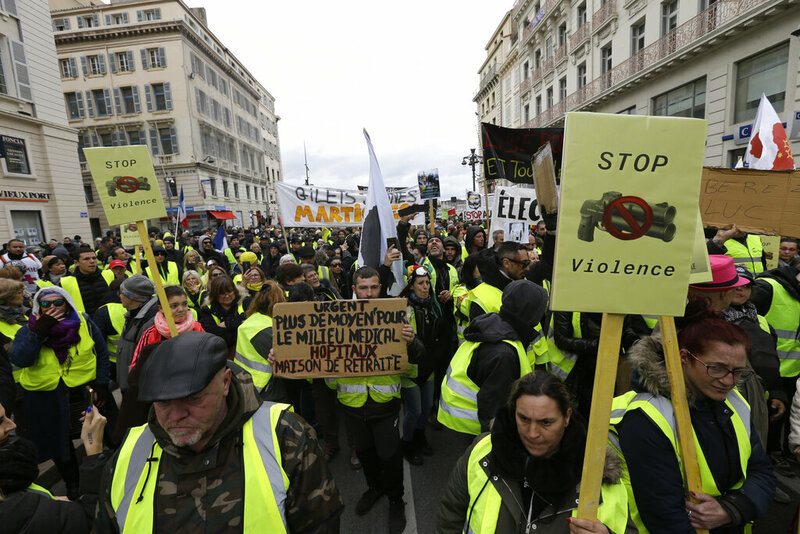 Catholic leaders in France have generally been cautious in their reactions to the demonstrations, expressing sympathy for those bearing the brunt of economic reforms but stopping short of supporting the “yellow vest” movement which has led to violence and destruction of property. Bishop Gilbert Aubry of the Diocese of Saint-Denis de la Réunion, on the small island of Réunion in the Indian Ocean, has been more forthright in addressing the situation, which has also affected this French territory. In an article released in the local media, Bishop Aubry said that while civil unrest and violence were unacceptable, the wider economic climate had to be considered.